In many ways the film was quite progressive in its imaginings of the future: beautification and environmental efforts, police forces comprised of mainly women (albeit in suspiciously skintight outfits), diversity in government. But one eerie parallel between the imagined 2015 and 1985 is, to me, a little too reminiscent of the past. 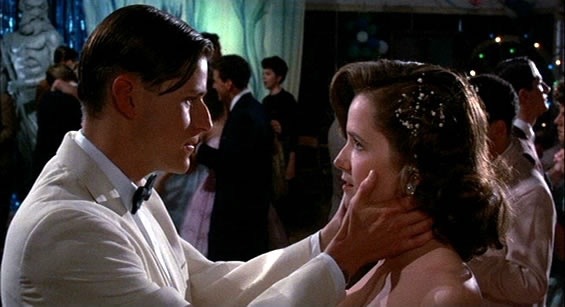 In many ways throughout the first two films, Lorraine, Marty’s mother, essentially has her fate and happiness determined by men – mainly the man she chooses to marry (though Marty does have a hand in things due to his interferences in time). – In the original 1985, her marriage to the spineless, inattentive George results in a dull, depressing, alcohol-fueled life. – In the new 1985 presented at the end of the first film, her marriage to the braver, more confident George results in a companionable relationship and a healthy, prosperous, and happy life for her and her children, which continues into the 2015 shown in Part II. 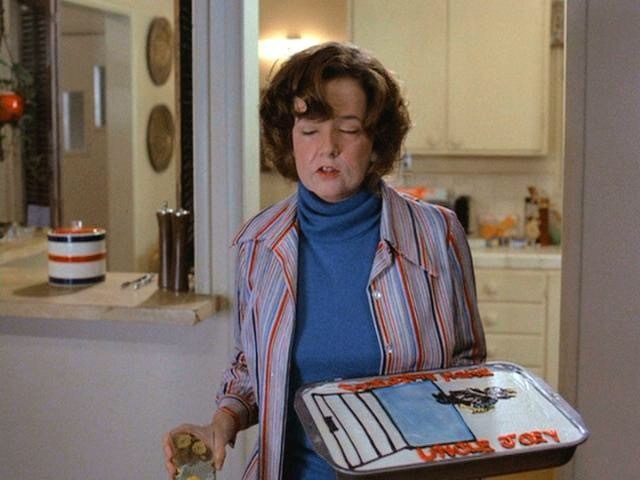 – And in the alternate 1985 of Part II, her marriage to Biff Tannen (which I have to believe she consented to only because of the huge debts left in the wake of George’s death in that timeline) leads to absolute abuse and misery for Lorraine, turned into a doll for Biff to enjoy, her finances held over her head when she steps out of line. In each case, the quality of Lorraine’s life is determined by the quality of man she is with, meaning it is the husband’s career and temperament that rule the day. No mention is made of her having a career or a life outside of the home in any of the timelines, and this is never questioned. Now of course it can be argued Lorraine grew up in a time when, for women of her background, marrying a good man was the key to a good life, so of course her marriage ends up defining her. She even says herself, she wants a man who is strong enough to protect her. She chooses not to be the breadwinner (though again, I would say that has to do with the society she lives in). So, it’s simply a reasonable, realistic depiction of a women of her age in that period. But that doesn’t explain what happens to the next woman to marry a McFly. In Part II, when swept to the future and taken by the cops to her future home, 18-year-old Jennifer Parker witnesses her future as Mrs. Marty McFly… and it’s not exactly pretty. Married in the cheap Chapel O’ Love and living in a trashy neighborhood, with a husband so insecure he’ll do anything to not be called a chicken, Jennifer’s life doesn’t look too different from the life of the original Lorraine, except perhaps slightly higher class. The future Jen isn’t seen for more than a few seconds, when she faints upon seeing her younger self, but while she doesn’t seem to be suffering to the same degree as the first Lorraine, we can infer that her marriage, and thus her life, also may not be in the best shape, especially after future Marty loses his job. In neither circumstance does it ever occur to the writers that the woman could take over as the breadwinner for her less-than-satisfactory husband. Thus, each woman’s fate is determined by the man they fall in love with. Now you can’t help who you love, but nonetheless this is a little backwards for a forward-thinking film. Thus, in this particular case, the film sadly seems to indicate more about the society of 1985 than that of a possible 2015 – a woman could have it all, as long as she didn’t have more than her husband. A woman could have a job, but her duty at home, to her family, was still tantamount. And, unfortunately, much of that mindset lingers on thirty years later. But maybe it’s more than that. Because the Back to the Future series is certainly shown to be capable of showing women as proactive fighters. Lorraine, even for her day, is quite a spitfire, as she stands up to Biff to the best of her ability (and, if we regard a tidbit from a certain interview with the writers as canon, 1985A’s Lorraine actually gives Biff what’s coming to him). Clara Clayton in Part III is intellectual and independent, holding her head high in a time that would have derided her as a spinster for her life choices. And minor characters like the cops and Griff’s tough-as-nails gangmate too show the writers are certainly willing to play with conceptions of women. Heck, the iconic hover board was a little girl’s toy! So perhaps the writers didn’t mean to imply that society in 2015 should treat women the same way they did in the 80s (which was a little stifling compared to what we aim for today). So, why have the Mrs. McFly of 2015 parallel the Mrs. McFly of 1985 instead of having her own life, her own set of problems? It comes down to the structure of the narrative: The Mrs. McFlys must parallel… in order for the Mr. McFlys to parallel. But even after Marty helps his dad, and therefore himself, to find the courage put themselves out there, the parallels between Marty and the George of the original timeline continue in Part II. Marty’s fatal flaw from Part II onward is his fear of being called a spineless coward… and the George of the first timeline, the one who Marty grew up with, is a spineless coward. Though George is timid and Marty reckless as a result, the flaw they deal with is essentially the same – they must learn to be brave enough to fight for others, but not to fight recklessly just to prove themselves. Whether they deal with this flaw or not affects not just them, but their wives and families as well. Thus, why Lorraine and Jennifer are paralleled. But this isn’t to say that Lorraine and Jen had no choice in the matter. But the reason they stay with the men of their choice, despite the destructive flaw, is also, I believe, paralleled. 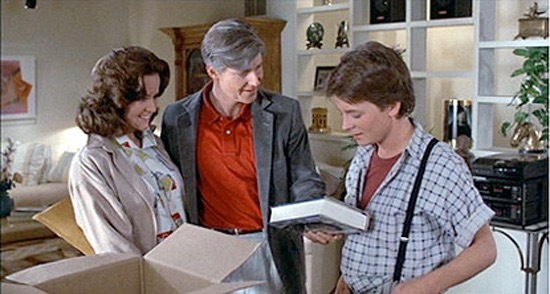 Marty, in the 2015 shown in the film, was also affected by a car accident – after getting goaded into a drag race that ended with hitting a Rolls Royce, he was put in debt, his hand so badly injured he couldn’t play anymore (interesting how the McFly’s fates are so connected to cars). While we can’t say for certain why Jennifer married him, we could probably conclude, based on the parallels to Lorraine, that she too was motivated by pity to stay with Marty, though at least Jennifer already loved Marty before the accident. Interestingly, having both women choose to stay in unhappy marriages out of pity does give the positive lesson that pity and obligation should not replace true love and respect between partners. But, on the flip side, this choice puts the onus to change in the men’s courts. I suppose this is necessary for the narrative in order to give the audience a reason to care about George and Marty’s transformations, which are the main character arcs of Part I and Parts II-III, respectively. It’s a powerful message in terms of showing how one person can make a difference, but the way it’s handled in this case certainly does the women no favors in terms of having their own agency. Another interesting parallel in the two generations of McFlys is how Lorraine regards Jennifer from afar. The two never interact on screen, but Lorraine’s opinion of the woman Marty loves is highlighted in both the original 1985 and the second 1985. In the original, Lorraine judges Jennifer’s romantic behavior toward Marty as too flirty and troublesome. She is so against any kind of advance made by the woman that Marty assumes she must have been a nun. But Lorraine’s disapproval with Jennifer said more about Lorraine herself – she shames Jennifer because she’s ashamed of her own rebellious behavior as a teenager. But in the new 1985 created by Marty’s meddlings, Lorraine likes Jennifer. Not only that, but rather than discourage forwardness and flirtation, Lorraine remains quite flirty with her own husband, and clearly doesn’t disapprove of her daughter dating as she did originally. This shows that the new Lorraine is no longer ashamed of who she was, and does not engage in shaming other girls’ behavior. So, gladly, we do get to see some character development for Lorraine as well, not just the boys, but as a result Jen is once again the indicator of another character’s development rather than getting much of her own. Still, it’s a small victory. While I love these films and gladly celebrate their thirty-year influence on pop culture, the treatment of Lorraine and Jennifer is very much a mixed bag in terms of progressing conversation about the roles of women in marriage and in wider society. Perhaps this isn’t the most important or memorable legacy of the film franchise, but Lorraine and Jennifer, as McFlys, are very important to the core themes of Back to the Future – confronting the past in order to make a better future. As we celebrate “the future” and how far we’ve come, we must also look at how far we must still go, and not just in terms of hoverboards and flying cars. So let’s make it a good one. Next Article What to Marathon When You’re Stuck Inside: 2016 Edition!